Recently the next generation NOOK device, the NOOK Tablet, has been released by Barnes & Noble. With many of the different specifications inside, the Nook Tablet has twice the power of its predecessor. Besides, the 7-inch LCD display seems very similar with the Nook Color. 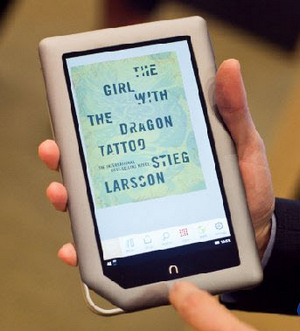 However, the Nook Tablet is just like its name, it is defined as a tablet PC rather than an e-reader. But compared with other tablet PC products, you will find the Nook Tablet has no advantage in almost every respect. Its 249$ price has still attracted many people to buy one. For most Nook Tablet users, enjoying Blu-ray movies on Nook Tablet seems to be the main use of it. Because of the lacking of Blu-ray ROM, we have to rip Blu-ray movies to Nook Tablet on Mac. Only in this way can you take Blu-ray movies on Nook Tablet. Now, let’s start to rip Blu-ray videos for Nook Tablet playing. To import the resource Blu-ray movies, you are offered three ways. Here we choose to import from BD ROM. Certainly before it, you must connect the external BD drive to your Mac and put the Blu-ray disc into it. To choose the output format, it proves that MP4 format is the most compatible format for Nook Tablet and other tablet PCs. 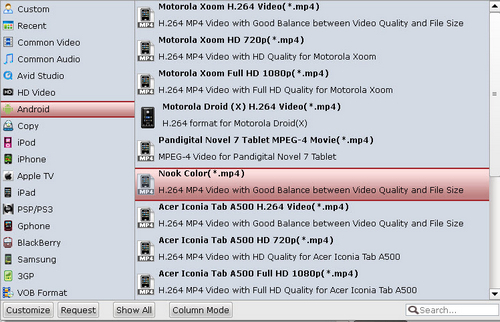 As Nook Tablet is similar with Nook Color, freely choose Android >> Nook Color (*.mp4). Surely you can choose other formats, but here I would take it for example. After format has been set, you can click the settings button and adjust the video and audio as you want. The default settings are listed below, general speaking; the default settings are fine with the output videos. Finally, start the conversion from Blu-ray to Nook Tablet compatible MP4 format. Before clicking the convert button, you can choose to merge several Blu-ray videos into one file for playing on Nook Tablet. With the USB cable, you can easily transfer Blu-ray movies to Nook Tablet for playing. Tips: During the whole conversion, please make sure the Mac is connected to the internet, or the conversion will fail. How to make WMV movies playable on Kindle Fire HD? How do I Back up and Burn a Blu-ray with Mac?